The Rhodian-standard silver issues described below, minted in the mid-fourth century BC, were the first autonomous silver coins produced by Miletus since the destruction of the city by the Persians in 494 BC. With their contemporary bronze counterparts they are also the first Milesian coins to feature Apollo, the patron of the city, and versions of the broad Apollo/lion type represented here continued to be issued at Miletus for the next two centuries. The Apollo/lion type as a whole has been monographed by Deppert-Lippitz (1984), and her classification forms the initial basis for the arrangement below, subject to important revisions by Kinns (1986), Ashton et al. (2002b), and Ashton and Kinns (2003). (1a) The rare fourth-century Rhodian hemidrachms of Didyma. Deppert-Lippitz briefly mentions (1984: 17) a rare fourth-century silver hemidrachm issue of Miletus inscribed ΕΓ ΔΙΔΥΜΩΝ ΙΕΡΗ and featuring a three-quarter facing portrait of Apollo on the obverse (Sear, 1979: #4504), a design similar to that seen on the third-century facing-Apollo bronze series (and also on the mid-fourth century silver of Hidrieus and Pixodarus). In his commentary on Deppert-Lippitz’s monograph, Kinns (1986: 237, n. 8) cites three known specimens: “ BMC 51; Naville sale 5.2574 (ex BMC 52); Paris. All from same dies?” The precise chronological placement of this rare issue is uncertain, and no examples are included in this collection. Included under this heading are the four series of silver Rhodian-standard tetradrachms (about 15.3 g), drachms (about 3.7 g), and hemidrachms (about 1.8 g) struck during Deppert-Lippitz’s Period I (1984: #1–257), which she dates from the death of Mausolus in 353 BC to the death of Alexander in 323 BC. The Rhodian standard, also known as the Chian standard, “achieved considerable popularity in Asia Minor [after 400 BC], and was also adopted at Ainos in Thrace. It was based on a tetradrachm of 15.6 gm” (Sear, 1979: xxxi; see also Kraay, 1976: 247ff. ; Melville Jones, 1986: 51, 202). In all these Rhodian-weight issues both the head of Apollo and the standing lion are to the left, and only rarely is an exergue line present. Deppert-Lippitz recognizes four chronological groupings based on die linkages and stylistic considerations, as shown below, with additions and corrections supplied from the subsequent work of Philip Kinns and his colleagues. Series I: Drachms (D-L #1–18) featuring the names ΛΕΥΚΙΠΠΟΣ, ΛΕΟΖΥΓΩΣ (corrected from ΛΕΟΖΥΓΟΣ; Kinns, 1986: 237), ΘΕΥΓΝΗΤΟΣ, ΗΡΑΓΟΡΑΣ, ΠΟΣΙΣ, ΜΕΛΑΙΝΕΥΣ, ΕΥΠΟΛΙΣ, ΕΠΑΜΕΝΩΝ (or ΕΠΑΜΕΙΝΩΝ; Kinns, 1986: 237), ΜΝΗΣΙΘΕΟΣ, ΑΝΤΙΠΑΤΡΟΣ, and ΧΑΡΟΠΙΝΟΣ. 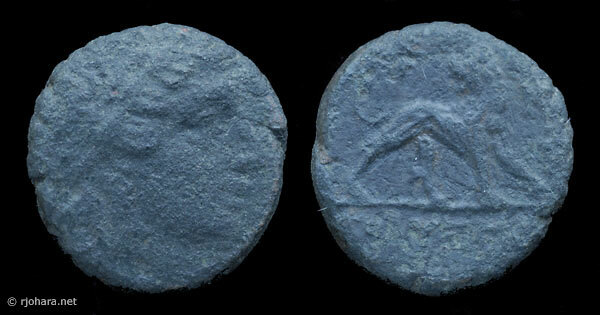 Kinns adds the name ΖΕΥΞΙΛΕΩΣ and argues that the coins of ΜΝΗΣΙΘΕΟΣ, ΑΝΤΙΠΑΤΡΟΣ, ΖΕΥΞΙΛΕΩΣ, and ΧΑΡΟΠΙΝΟΣ, which have six-pointed suns/stars, are the earliest in the series (Kinns, 1986; Ashton and Kinns, 2003; see below). Series I: Hemidrachms (D-L #19–67) featuring the names ΠΟΣΙΣ, ΜΕΛΑΙΝΕΥΣ, ΕΥΠΟΛΙΣ, ΗΡΑΓΟΡΑΣ, ΣΚΥΘΗΣ, ΘΕΥΓΝΗΤΟΣ, ΘΕΟΔΟΤΙΔΗΣ, ΧΑΡΙΛΑΣ, ΠΥΘΩΝ, ΑΛΚΙΜΑΧΟΣ, ΑΝΤΙΑΝΔΡΟΣ, ΑΝΔΡΙΟΣ, ΔΗΜΕΑΣ, ΠΡΟΞΕΝΟΣ, ΔΙΟΔΩΡΟΣ (? ), and ΛΑΜΙΟΣ. Kinns notes (1986: 249–251) that the name ΧΑΡΙΛΑΣ on D-L #46–49 is in fact written ΧΑΡΙΛΑϹ (with a lunate sigma), and that some of the hemidrachms of ΜΕΛΑΙΝΕΥΣ, ΕΥΠΟΛΙΣ, ΣΚΥΘΗΣ, ΘΕΥΓΝΗΤΟΣ, and ΠΥΘΩΝ have six-pointed suns/stars. Series II: Tetradrachms (D-L #68–93) featuring the names ΔΗΜΑΙΝΟΣ, ΘΕΟΠΡΟΠΟΣ, ΛΗΝΑΙΟΣ, ΒΡΕΜΩΝ, ΣΤΡΑΤΙΔΗΣ, ΔΑΜΝΑΣ, and ΛΥΚΟΣ. Study of the Pixodaros Hoard (Ashton et al., 2002b) adds the names ΣΙΜΟΣ, ΚΑΛΛΑΙΣΧΡΟΣ, and ΕΟΑΝΘΗΣ. Series II: Drachms (D-L #94–151) featuring the names ΔΗΜΑΙΝΟΣ, ΘΕΥΠΡΟΠΟΣ/ΘΕΟΠΡΟΠΟΣ, ΛΗΝΑΙΟΣ, ΔΑΜΝΑΣ, ΒΡΕΜΩΝ, ΣΙΜΟΣ, ΣΤΡΑΤΙΔΗΣ, ΘΕΟΓΝΗΤΟΣ, ΛΥΚΟΣ, ΚΑΛΛΑΙΣΧΡΟΣ, ΕΡΑΣΙΝΟΣ, and ΕΟΣΕΒΗΣ. Series II: Hemidrachms (D-L #152–156) featuring the names ΔΗΜΑΙΝΟΣ, ΘΕΟΠΡΟΠΟΣ, and ΣΤΡΑΤΙΔΗΣ. Series III: Tetradrachms (D-L #157–159) featuring the name ΑΡΤΕΜΩΝ. Series III: Drachms (D-L #160–183) featuring the names ΑΡΤΕΜΩΝ, ΑΝΤΙΠΑΤΡΟΣ, ΡΟΔΙΟΣ, ΠΑΝΤΑΙΝΟΣ (or ΠΑΝΤΑΙΝΕ[ΤΟΣ]; Kinns, 1986: 237), and ΝΟΣΣΟΣ. Series III: Hemidrachms (D-L #184–196) featuring the names ΑΡΤΕΜΩΝ, ΑΝΤΙΠΑΤΡΟΣ, ΡΟΔΙΟΣ, ΠΑΝΤΑΙΝΟΣ, and ΝΟΣΣΟΣ. Series IV: Drachms (D-L #197–236a) featuring the names ΟΡΝΥΜΕΝΟΣ, ΜΗΤΡΟΔΩΡΟΣ, ΛΑΜΠΙΣ, ΝΕΩΝ, ΛΥΚΟΣ, ΒΑΤΤΟΣ, ΚΥΔΙΜΟΣ, ΕΠΙΓΟΝΟΣ, ΑΡΙΣΤΑΓΟΡΑΣ, ΤΙΜΟΣΤΡΑΤΟΣ, ΕΠΙΝΙΚΟΣ, ΤΕΛΕΣΙΑΣ, ΔΙΟΠΟΜΠΟΣ, and ΠΡΟΞΕΝΟΣ. Kinns (1986: 238) adds the name [ΦΑ]ΝΟΔΙΚΟΣ, a corrected reading for D-L #217 (ΚΥΔΙΜΟΣ). Series IV: Hemidrachms (D-L #237–257) featuring the names ΔΙΟΠΟΜΠΟΣ, ΠΡΟΞΕΝΟΣ, and [Α]ΡΙΣΤΑΓΟΡΑΣ. Series not specified: Kinns (1986: 238) reports additional drachms featuring the names ΗΓΗΣΑΓΟΡΑΣ and [Θ]ΕΡΣΙΤΗΣ (“perhaps a misreading of D-L 148(b) ΕΟΣΕΒΗΣ”). In his essay-review of Deppert-Lippitz’s monograph, Kinns (1986: 238–239) lists more than 60 additional specimens from these series that were not included in D-L’s survey, including drachms that name four additional magistrates as noted above. He also observes that a small number of coins from D-L’s Series I feature suns/stars with only six points rather than the usual eight, a detail that connects them with the bronze issues of the same period (see below) and places them at the beginning of the entire range of Apollo/lion silver: “In view of the exceptional six-rayed stars on the drachm reverses of ΜΝΗΣΙΘΕΟΣ, ΑΝΤΙΠΑΤΡΟΣ, and ΧΑΡΟΠΙΝΟΣ (D-L 15–17), which share an obverse die of notably high quality (V10=V11), one is tempted to ask whether these are not the first silver coins of fourth-century Miletus; the small well-formed letters of their legends are also noteworthy” (Kinns, 1986: 250). there was clearly, as Deppert–Lippitz suggested, an interval between the tetradrachms of Series II (finished by c. 341/0) and the tetradrachm issue of Artemon, and the smaller denominations that seem to accompany it (Series III). The absence of any issues of Series III from the Pithyos hoard [ IGCH #1217, buried about 335 BC] further suggests that this later Series all belongs post c. 335. Between c. 341/0 and 335 there may simply have been a gap in production at the Milesian mint, or it may be that to these years belong the issues of the Series II magistrates known only from drachms (Theognetos, Erasinos and Eosebes, D-L. 140, 148 and 149). The headings used below summarize current understanding of the varieties and chronology of all the fourth-century Rhodian-standard Apollo/lion issues, as detailed above. Specimens are recorded that name ΛΕΥΚΙΠΠΟΣ, ΛΕΟΖΥΓΩΣ, ΘΕΥΓΝΗΤΟΣ, ΗΡΑΓΟΡΑΣ, ΠΟΣΙΣ, ΜΕΛΑΙΝΕΥΣ, ΕΥΠΟΛΙΣ, ΕΠΑΜΕΝΩΝ (or ΕΠΑΜΕΙΝΩΝ), ΜΝΗΣΙΘΕΟΣ, ΑΝΤΙΠΑΤΡΟΣ, ΖΕΥΞΙΛΕΩΣ, and ΧΑΡΟΠΙΝΟΣ, with the the last four magistrates, whose coins have six-pointed suns/stars, standing at the beginning of the series. No examples are included in this collection. Specimens are recorded that name ΠΟΣΙΣ, ΜΕΛΑΙΝΕΥΣ, ΕΥΠΟΛΙΣ, ΗΡΑΓΟΡΑΣ, ΣΚΥΘΗΣ, ΘΕΥΓΝΗΤΟΣ, ΘΕΟΔΟΤΙΔΗΣ, ΧΑΡΙΛΑϹ, ΠΥΘΩΝ, ΑΛΚΙΜΑΧΟΣ, ΑΝΤΙΑΝΔΡΟΣ, ΑΝΔΡΙΟΣ, ΔΗΜΕΑΣ, ΠΡΟΞΕΝΟΣ, ΔΙΟΔΩΡΟΣ (? ), and ΛΑΜΙΟΣ. One example is included in this collection. Some, though not all, of the specimens naming ΜΕΛΑΙΝΕΥΣ, ΕΥΠΟΛΙΣ, ΣΚΥΘΗΣ, ΘΕΥΓΝΗΤΟΣ, and ΠΥΘΩΝ have six-pointed suns/stars. RJO 96. 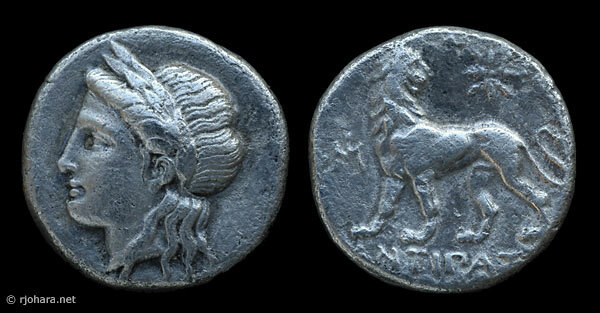 Silver hemidrachm (1.62 g, ↑↑), about 353–345 BC. Obverse: laureate head of Apollo left. Reverse: lion standing left on exergue line, looking back at eight-pointed sun; ΜΙ monogram to left; magistrate ΣΚΥΘΗΣ in exergue. Compare Deppert-Lippitz (1984: #34–37, pl. 2, all naming this magistrate); this specimen appears to be a die duplicate of D-L’s #35a, struck from obverse die V11 and reverse die R13. (Note that on D-L’s plate 2 the obverse die of #34 is mislabeled V1 [for V11] and the reverse die of #36 is mislabeled R12 [for R14].) The hemidrachms of ΣΚΥΘΗΣ are among the few Period I silver coins to have a reverse exergue line. Specimens are recorded that name ΔΗΜΑΙΝΟΣ, ΘΕΟΠΡΟΠΟΣ, ΛΗΝΑΙΟΣ, ΒΡΕΜΩΝ, ΣΤΡΑΤΙΔΗΣ, ΔΑΜΝΑΣ, ΛΥΚΟΣ, ΣΙΜΟΣ, ΚΑΛΛΑΙΣΧΡΟΣ, and ΕΟΑΝΘΗΣ. No examples are included in this collection. Specimens are recorded that name ΔΗΜΑΙΝΟΣ, ΘΕΥΠΡΟΠΟΣ/ΘΕΟΠΡΟΠΟΣ, ΛΗΝΑΙΟΣ, ΔΑΜΝΑΣ, ΒΡΕΜΩΝ, ΣΙΜΟΣ, ΣΤΡΑΤΙΔΗΣ, ΘΕΟΓΝΗΤΟΣ, ΛΥΚΟΣ, ΚΑΛΛΑΙΣΧΡΟΣ, ΕΡΑΣΙΝΟΣ, and ΕΟΣΕΒΗΣ. No examples are included in this collection. Specimens are recorded that name ΔΗΜΑΙΝΟΣ, ΘΕΟΠΡΟΠΟΣ, and ΣΤΡΑΤΙΔΗΣ. No examples are included in this collection. Specimens are recorded that name ΑΡΤΕΜΩΝ. No examples are included in this collection. Specimens are recorded that name ΑΡΤΕΜΩΝ, ΑΝΤΙΠΑΤΡΟΣ, ΡΟΔΙΟΣ, ΠΑΝΤΑΙΝΟΣ (or ΠΑΝΤΑΙΝΕ[ΤΟΣ]), and ΝΟΣΣΟΣ. Two examples are included in this collection. RJO 100. 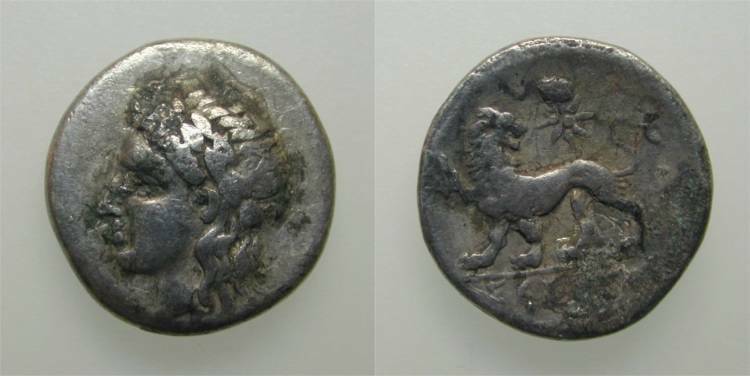 Silver drachm (3.16 g, ↑↑), about 335–323 BC. Obverse: laureate head of Apollo left. Reverse: lion standing left, looking back at eight-pointed sun; ΜΙ monogram to left; magistrate [Α]ΡΤΕΜ[ΩΝ] in exergue; no exergue line. This coin was struck from Deppert-Lippitz’s obverse die V8, which was also used with reverses of ΑΝΤΙΠΑΤΡΟΣ, ΡΟΔΙΟΣ, and ΠΑΝΤΑΙΝΟΣ or ΠΑΝΤΑΙΝΕ[ΤΟΣ]; D-L does not record its use with any ΑΡΤΕΜΩΝ reverses (1984: #160–164 [ΑΡΤΕΜΩΝ], #165–183 [others], pls. 6–7). The reverse die of this specimen does not match either of the two ΑΡΤΕΜΩΝ reverses illustrated by D-L (V1–V2); additional reverses are represented by SNG von Aulock #2093 (V3) and Pozzi #2485 (V4), neither of which are illustrated by D-L and neither of which I have seen. Kinns records two additional ΑΡΤΕΜΩΝ specimens: “G. Hirsch sale 41.89; Swiss Bank Corporation FPL (Autumn 1980).85” (1986: 238). The use of this one obverse with reverses of at least four different magistrates suggests, as was the case with the tetradrachms of the Pixodarus Hoard, noted above, that a “board” of magistrates was striking drachms simultaneously rather than sequentially. RJO 24. 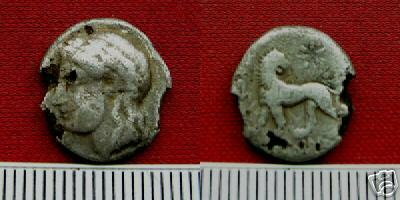 Silver drachm (3.45 g, ↑↑), about 335–323 BC. Obverse: laureate head of Apollo left. Reverse: lion standing left, looking back at eight-pointed sun; ΜΙ monogram to left; magistrate [Α]ΝΤΙΠΑΤ[ΡΟΣ] in exergue; no exergue line. Compare Deppert-Lippitz (1984: #165–171, pls. 6–7, all naming this magistrate); this obverse is close to D-L #171, but does not appear to be an exact die match for any of the D-L specimens. Specimens are recorded that name ΑΡΤΕΜΩΝ, ΑΝΤΙΠΑΤΡΟΣ, ΡΟΔΙΟΣ, ΠΑΝΤΑΙΝΟΣ, and ΝΟΣΣΟΣ. No examples are included in this collection. Specimens are recorded that name ΟΡΝΥΜΕΝΟΣ, ΜΗΤΡΟΔΩΡΟΣ, ΛΑΜΠΙΣ, ΝΕΩΝ, ΛΥΚΟΣ, ΒΑΤΤΟΣ, ΚΥΔΙΜΟΣ, ΕΠΙΓΟΝΟΣ, ΑΡΙΣΤΑΓΟΡΑΣ, ΤΙΜΟΣΤΡΑΤΟΣ, ΕΠΙΝΙΚΟΣ, ΤΕΛΕΣΙΑΣ, ΔΙΟΠΟΜΠΟΣ, ΠΡΟΞΕΝΟΣ, and [ΦΑ]ΝΟΔΙΚΟΣ. No examples are included in this collection. Specimens are recorded that name ΔΙΟΠΟΜΠΟΣ, ΠΡΟΞΕΝΟΣ, and [Α]ΡΙΣΤΑΓΟΡΑΣ. No examples are included in this collection. One fourrée specimen—an ancient counterfeit—is included here. RJO 119. Fourrée drachm (2.62 g, ↑↑), about 353–323 BC. Obverse: laureate head of Apollo left. Reverse: lion standing left, looking back at sun (apparently seven-pointed, but not completely clear); ΜΙ monogram to left; no exergue line; magistrate in exergue unfortunately not legible, although a few letters might be worked out with more comparative material. This is a fourrée specimen, with the base metal core clearly visible along both margins where the silver coating has cracked off. Included under this heading is the bronze coinage that Deppert-Lippitz assigns to her Period II (1984: #304–435). She dates these issues from the time of the liberation of Miletus by Antigonus Monophthalmos to its takeover by Lysimachus (about 313–290 BC). In his essay-review of Deppert-Lippitz’s monograph, Kinns argues that these bronze coins are in fact contemporaneous with the first Rhodian-standard Apollo/lion issues in silver (described above), and began to appear about 350 BC (1986: 249–253). In the silver issues, Apollo and the lion face left; in the bronze, they face right. Five series are recognized by Deppert-Lippitz, issued under a variety of magistrates as noted below, with Kinns’ detailed reasoning on the chronology added. The ΜΙ monogram is not present on any of these coins, and an exergue line is present only on a few of the bronzes in Series IV, which may have been issued later. Conversely, the fact that the new bronze of Leukippos has eight-pointed star and name reading downwards, and is therefore ‘normal’ in both respects, tends to confirm that his issues belong later in their respective series. Series II: 13 mm and 2.0 g (D-L #318–335) featuring the names ΑΝΤΙΠΑΤΡΟΣ, ΙΣΤΙΚΑΣ (or ΙΣΤΙΚΩΝ; Kinns, 1986: 237), ΟΡΝΥΜΕΝΟΣ, ΦΙΛΟΚΛΗΣ, ΕΥΚΤΗΜ[…], ΑΝΤΙΑ[…], [Π]ΟΔΙΟ[Σ], ΛΑΜΠΡΟΜΑΧΟΣ, and ΜΟΛΠΑΓΟΡΑΣ. Kinns (1986: 241) adds the names ΑΡΧΕΜΑΧΟΣ and ΒΑΤΤΟΣ to this series. On the specimens naming ΑΝΤΙΠΑΤΡΟΣ, ΙΣΤΙΚΑΣ, and ΦΙΛΟΚΛΗΣ the lettering runs vertically downwards to the right of the lion (Ashton and Kinns, 2003: 6). These coins were probably the functional replacement for the first lion/sun bronzes of Miletus. Series III: 18–20 mm and 8.0 g (D-L #336–340) featuring the names ΕΠΙΣΘΕΝΗΣ, ΝΙΚΕΑΣ, […]Ν[…]ΕΥ[…], and [Ο]ΡΝΥΜΕΝ[ΟΣ]. Kinns (1986: 241) adds ΕΥΚΤΗΜΩΝ. “Few examples of this heavy large denomination survive, but they are stylistically uniform, and three of the four known complete names also appear in series I or II. The Apollo/lion bronzes were therefore in at least three denominations at the very beginning, although the largest was soon dropped” (Kinns, 1986: 251). Within these Series IV bronzes, Kinns distinguishes a number of early and late varieties. Four varieties are clearly early, with a possible “starting date in the third quarter of the fourth century. Those of ΠΑΡΡΑϹΙΟϹ (D-L 368–9) and ΘΕΥΚΡΙΤΟΣ (D-L 373–4) show a name which is partly vertical at right, somewhat reminiscent of series I and II, while the issues of ΕΠΙΝΙΚΟΣ (D-L 341) and *ΦΑΝΟΔΙΚΟϹ…may be contemporary with the [silver Series IV] drachms bearing the same names…, both dated to the 320s. Particularly interesting is the occurrence of lunate sigmas on the bronzes of ΠΑΡΡΑϹΙΟϹ, ΦΑΝΟΔΙΚΟϹ, and ΜΟΛΟϹϹΟϹ (D-L 355–65)—a feature not noticed by D-L, but also in fact found on silver [Series I] hemidrachms of ΧΑΡΙΛΑϹ (D-L 46–9)” (Kinns, 1986: 251). The late issues within Series IV include (among others) the specimens that have an exergue line. These coins “must be exactly contemporary with the reduced [Rhodian] weight didrachms of D-L’s Period III [that were issued about 310 BC during a gap in the production of Milesian Alexanders, rather than with the full-weight Rhodian silver of Period I, above], for no fewer than 10 of the 14 recorded magistrates also appear among the 30 names of that silver series; stylistic details, notably Apollo’s elaborate hair-styling and broad laurel wreath, the exergue line, and the occasional use of a sixteen-rayed star all confirm this relationship (D-L, p. 59), and a remarkable case of parallel die sharing in the two metals can now be reported. In the [late group of Series IV] bronze a single obverse links coins of ΛΥΚΟΣ (D-L 379), ΒΑΣΙΛΕΙΔΗΣ (D-L 380), and ΠΡΩΤΑΡΧΟΣ (Kinns; cf. D-L 381), and the same trio are also linked in [the Period III reduced-Rhodian didrachms in] silver (D-L 446–8, all from V6)” (Kinns, 1986: 251). But it may be that at least one further speculation concerning the Series V specimens should be permitted: the single ΧΑΡΟ specimen in this series (D-L #407, pl. 13) in fact has a sun/star of six points rather than eight, strongly suggesting that ΧΑΡΟ is indeed ΧΑΡΟΠΙΝΟΣ, “the magistrate of the earliest Apollo/lion silver and bronze,” and that the bronze of Series V is contemporaneous with the bronze of Series I–III, as well as with the earliest Rhodian-standard silver issues, as Kinns conjectured. The headings used below summarize current understanding of all the fourth-century bronze Apollo/lion issues, as detailed above. Specimens are recorded that name ΕΠΙΣΘΕΝΗΣ, ΔΙΟΝΥΣΙΟΣ, ΧΑΡΟΠΙΝΟΣ, ΛΥΚΟΜΗΔΗΣ, ΣΦΟΔΡΙΣ, ΒΙΟΝ, ΑΝΤΙΠΑΤΡΟΣ, ΕΓΔΙΚΟΣ, [ΕΡ]ΓΙΝΟΣ, [ΛΑ]ΜΠΙΤΟΣ, ΖΕΥΞΙΛΕΩ[Σ], ΛΕΥΚΙΠΠΟΣ, ΝΙΚΟΛΟΧΟΣ, ΞΕΝΟΚΡΙΤΟΣ, and [Π]ΟΣΕΙΔΩΝ[ΙΟΣ]. One example is included in this collection. RJO 112. 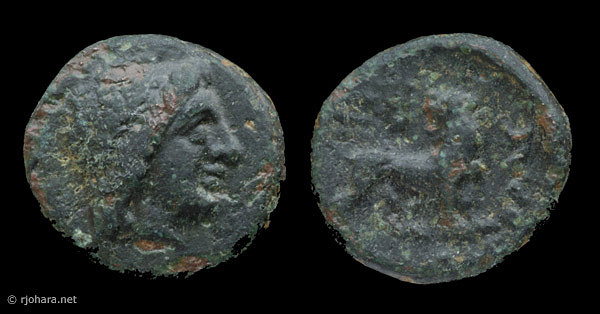 Bronze 15 × 16 mm (2.42 g, ↑↑), 353–323 BC. Obverse: laureate head of Apollo right. Reverse: lion standing right, looking back at eight-pointed sun; no exergue line and no inscription in exergue; inscription vertically at right, not quite legible but might be worked out with more comparative material. This specimen certainly belongs among the earliest of the Apollo/lion bronzes, but it does not appear to be a die match for any of the Series I specimens illustrated by Deppert-Lippitz (1984: #304–317). Specimens are recorded that name ΑΝΤΙΠΑΤΡΟΣ, ΙΣΤΙΚΑΣ (or ΙΣΤΙΚΩΝ), ΟΡΝΥΜΕΝΟΣ, ΦΙΛΟΚΛΗΣ, ΕΥΚΤΗΜ[…], ΑΝΤΙΑ[…], [Π]ΟΔΙΟ[Σ], ΛΑΜΠΡΟΜΑΧΟΣ, ΜΟΛΠΑΓΟΡΑΣ, ΑΡΧΕΜΑΧΟΣ, and ΒΑΤΤΟΣ. No examples are included in this collection. Specimens are recorded that name ΕΠΙΣΘΕΝΗΣ, ΝΙΚΕΑΣ, […]Ν[…]ΕΥ[…], [Ο]ΡΝΥΜΕΝ[ΟΣ], and ΕΥΚΤΗΜΩΝ. No examples are included in this collection. Specimens are recorded that name ΕΠΙΝΙΚΟΣ, ΑΝΤΙΑΝΔΡΟΣ, ΜΟΛΟϹϹΟϹ, ΜΟΡΙΑΣ, ΠΑΡΡΑ[ϹΙΟϹ], [Δ]ΙΟΜΙΛ[ΟΣ], ΘΕΥΚΡΙΤ[ΟΣ], ΒΑΤΤΑΡΟΣ, ΛΥΚΟΣ, ΒΑΣΙΛΕΙΔΗΣ, ΠΡΩΤΑΡΧΟΣ, ΦΑΙΔΜΟΣ, ΧΑΡΜΗΣ, ΕΧΕΒΟΥΛΟΣ, ΜΝΗΣΙΘΕΟΣ, ΛΑΜΠΡΟΜΑΧΟΣ, [Λ]ΕΟΝΤΕ[ΥΣ], ΑΝΤΙΑΝΩΡ (or perhaps ΑΝΤΙΑΝΔΡΟΣ as above), ΑΡΙΣΤΑΓΟΡΑ, ΔΑΜΑΣΙΑΣ, ΘΕΑΝΔΡΟΣ, ΤΙΜΟΘΕΟΣ, [ΦΑ]ΝΟΔΙΚΟϹ, and ΦΙΛΙΣΚΟΣ. 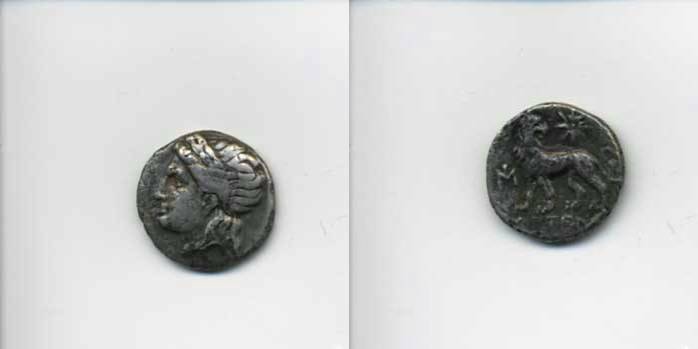 As noted above, Kinns recognizes within Series IV an early group that was minted in parallel with the Rhodian-weight silver above, as well as a late group which he believes was minted about 310 BC in parallel with the reduced-Rhodian silver didrachms of Miletus. This late group is distinguished by the presence of an exergue line, as seen on the reverses of ΛΥΚΟΣ, ΔΑΜΑΣΙΑΣ, ΘΕΑΝΔΡΟΣ, ΤΙΜΟΘΕΟΣ, and ΦΙΛΙΣΚΟΣ. One example of the early Series IV group is included in this collection, and two examples of the late Series IV group are described alongside the reduced-Rhodian didrachms on a separate page, following Kinns’ chronology. RJO 121. 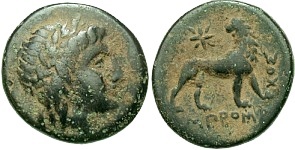 Bronze 17 × 18 mm (4.30 g, ↑↑), 353–323 BC. Obverse: laureate head of Apollo right. Reverse: lion standing right, looking back at eight-pointed sun; no exergue line; [ΛΑ]ΜΠΡΟΜΑΧΟΣ in exergue running left-to-right, with last three letters running vertically upwards to right of lion; the sigma is not lunate. Deppert-Lippitz describes a single specimen of this denomination naming ΛΑΜΠΡΟΜΑΧΟΣ (1984: #388), certainly not from the same dies as RJO 121 but almost certainly from dies cut by the same hand. D-L #388 and RJO 121 also appear to have a similar patination, although it is not clear from D-L’s illustration whether her specimen has any vertical lettering. D-L #388 is said to have come from a hoard deposited about 300 BC in Mylasa and recovered in 1968 or 1969 (Deppert-Lippitz, 1984: 157, citing Thompson et al., 1973: 172, #1289–1290, with details of the hoard on file in the British Museum). Could this specimen also be from that Mylasa hoard? Specimens are recorded that name ΛΑΜΠΡΟΜΑΧΟΣ, ΑΡΙΣΤΑΓΟΡΑΣ, ΑΝΤΙΑΝΔΡΟΣ, ΜΟΛΟΣΣΟΣ, ΧΑΡΟ[ΠΙΝΟΣ], ΛΕΟΝΤΙΣΚΟΣ, ΑΝ[ΔΡΙΟΣ], ΧΑΡΜΗΣ, ΔΗΜΟΣΘΕΝΗΣ, ΔΗΜΗΤ[ΡΙΟΣ], ΕΠΙΝΙΚΟΣ, and ΠΥΡΑΜΕΝ, with the ΧΑΡΟ[ΠΙΝΟΣ] specimens being the earliest from the entire period. One Series V example is included in this collection. RJO 75. Bronze 10 × 11 mm (0.98 g, ↑↑), 353–323 BC. Obverse: laureate head of Apollo right. Reverse: lion standing right, looking back at sun; no exergue line; inscription appears to run left-to-right in the exergue (where it is barely visible), and then vertically at right as in D-L #399–400 (ΛΑΜΠΡΟΜΑΧΟΣ), but the vertical section is also not clearly legible; the final letter appears to be a lunate sigma; with more comparative material in hand the inscription might be worked out.